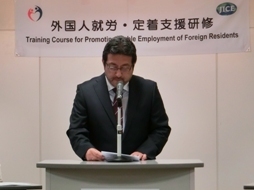 The first opening ceremony of the Training Course for Promoting Stable Employment of Foreign Residents in FY2015 was held. 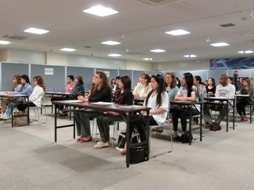 The first opening ceremony of the Training Course for Promoting Stable Employment of Foreign Residents in FY2015 was held at the Hamamatsu Shimin Kyodo Center. 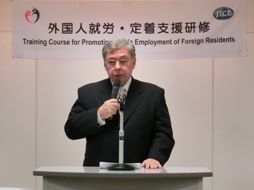 This opening ceremony was held with the attendance of Ms. Natsuko HORII, Director of Foreign Workers’ Affairs Division, Employment Measures for the Dispatched and Fixed-term Workers Department, Employment Security Bureau of the Ministry of Health, Labour and Welfare, Consul General José Antonio Piras of the Consulate General of Brazil in Hamamatsu, Consul General Jorge Jallo of the Consulate General of the Republic of Peru in Tokyo, and persons concerned from Shizuoka Labor Bureau,　Hamamatsu Public Employment Security Office (Hello Work Hamamatsu,) Shizuoka-ken and Hamamatsu-shi. 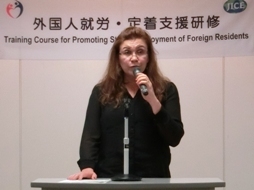 On behalf of the participants, Ms. Pessoa Sueli from Brazil expressed her determination to participate the training actively and master Japanese language to secure stable employment. 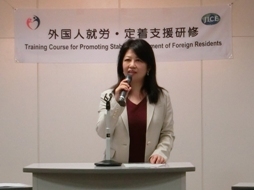 Ms. Masako KISHIMOTO, Vice President of JICE encouraged participants to get stable job by learning Japanese communication skills at the workplace and acquiring knowledge regarding employment thorough this training course. 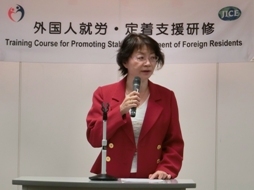 In FY 2015, 250 training courses are planned to be held in 82 areas of 15 prefectures. JICE will implement those courses aiming for the realization of smooth job-hunting activities and stable employment of foreign residents.